Looking for fume extractor and / or an air filtration system solution to your 3D printing, AM application? We’ll be happy to assist you. Call us toll free, 1-800-626-0664 from anywhere in North America or +1-514-364-5538 outside of the Continental US and Canada. You can also use the contact from below – we will get back to you as soon as possible. 3D printing, also known as additive manufacturing (AM), refers to processes used to create a three-dimensional objectin which layers of material are formed under computer control to create an object. Objects can be of almost any shape or geometry and are produced using digital model data from a 3D model or another electronic data source such as an Additive Manufacturing File (AMF) file. STL is one of the most common file types that 3D printers can read. Thus, unlike material removed from a stock in the conventional machining process, 3D printing or AM builds a three-dimensional object from computer-aided design (CAD) model or AMF file by successively adding material layer by layer. 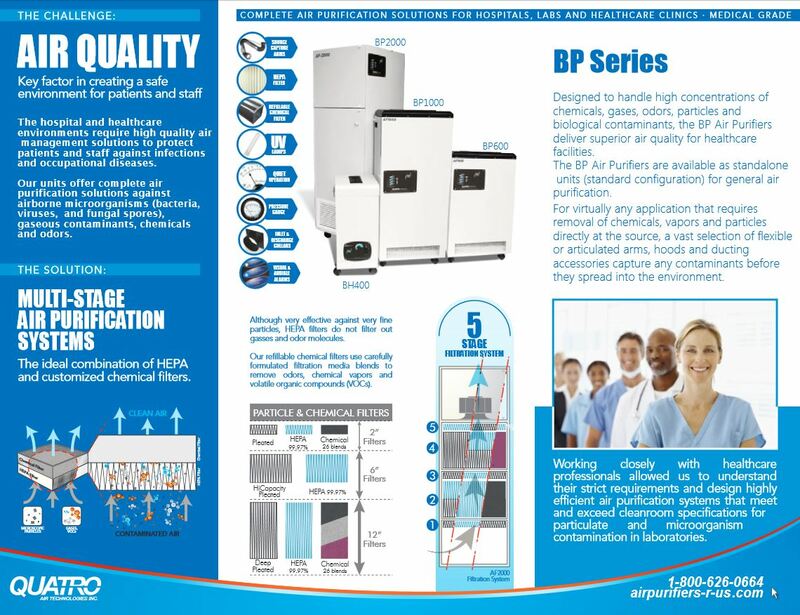 Designed to handle high concentrations of chemicals, gases, odors, particles and biological contaminants, the BP Air Purifiers deliver superior air quality for healthcare facilities. The BP Air Purifiers are available as standalone units (standard configuration) for general air purification. For virtually any application that requires removal of chemicals, vapors and particles directly at the source, a vast selection of flexible or articulated arms, hoods and ducting accessories capture any contaminants before they spread into the environment. What would one of our BP1001 be doing inside a CT Scan room you may ask??? To reduce dust, lint, and other airborne particulates from the linens – linen changes, dust particulates that come in from outside the room, the hospital or clinic corridor / hallway, etc. Yup, the BP1001 is configured for dust and airborne particulates filtration. Contact us for help with your product and model selection. Call 1-800-626-0664 or fill in and send in the form below. Effective solution to wide range of airborne chemicals and odors: exhaust gases, paints, lacquers, cleaning supplies, pesticides, building materials and furnishings, office equipment, glues, adhesives, disinfectants, and many more. Reduce gas phase contaminants to below OSHA’s TLV levels. blower motor which guarantee a very high volumetric flow rate. Highly customizable, capable to eliminate a huge variety of pollutants. By using various combinations of filters and 26 different chemical filtration media, the BP2000 is the air filtration system of choice against high concentrations of aldehydes, alcohols, acids, VOCs, fluorinated hydrocarbons, chlorinated hydrocarbons, alkenes and alkanes, acetates and many other chemical groups. Call us toll free from anywhere in North America – 1-800-626-0664, or via Skype: lito.espinosa, or fill out the Contact Form below for help in choosing the right clean air solution to your needs.